Where did humanity come from? And where is it going? To the airport, as it turns out. Recently, social media marketing firm Socialbakers used Facebook’s new Graph Search feature to compile a list of the places mobile Facebook users like to check-in at the most. 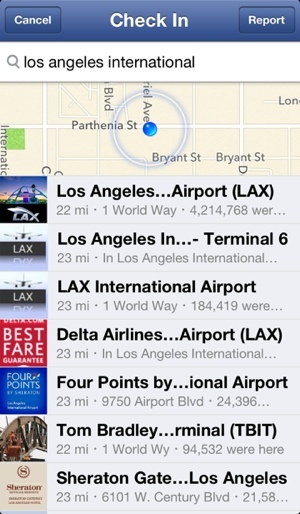 Their research revealed that of the 50 most popular locations for check-ins on Facebook, no fewer than 37 are airports. Los Angeles International Airport (LAX) earned the title as the most checked-in to place on the planet. Facebook’s Palo Alto headquarters earned the number two spot, while Chicago O’Hare, San Francisco International and Dallas/Fort Worth International round out the top five. As for the top non-airport destinations for Facebookers, Disneyland comes in at #9, New York’s Times Square is #12 and Siam Paragon, a massive Thailand shopping mall, was the 20th most checked-in to place on the social network. Four sports venues made the list: the San Francisco Giants’ AT&T Park (#26), Rangers Ballpark (#34), Yankee Stadium (#46) and Dodger Stadium (#50). The fact that the list is dominated mostly by airports shouldn't be surprising. The start of a vacation is an exciting time for most people, and good news is exciting to share. Still, you should use caution before you check-in anywhere – thieves love knowing when your home will be unguarded. Remember, Facebook privacy settings are your friend. You can visit Socialbakers.com to see the most up-to-date rankings and to find out how your favorite check-in location rates.